Currently I have two book projects on the go, having finished one of the four I was working on last time I updated this page, and put another one on the back burner. As I was finishing Not by Love Alone, I began to work on another book about music in modern Japan, tentatively titled, Sounds of Modern Times: Japan’s Changing Musical Culture, 1850-1950. My aim is to explore the changes in the musical culture of Japan after the introduction of Western music from the mid-nineteenth century onwards. By “musical culture” I mean all activities related to music. Within these roughly one hundred years Western music came to dominate musical culture, while Japan’s traditional musical gernes came to occupy relatively marginal spaces. Music is a particularly rewarding field for studying cultural interaction and transnational flows. Yet it seems to me that scholars are only just beginning to pay more attention to music. In my book I also plan to explore and discuss the question what research into musical culture can contribute to our understanding of past cultures in general. The project has not progressed quite as far as I’d like, partly because I got sidetracked by invitations to lecture and to submit articles, and partly, because I have been rethinking the book. 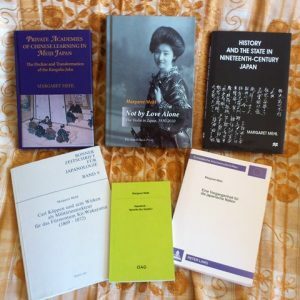 I believe the world is not quite ready yet for the book I had in mind, and have decided to devote a greater part of it to make my case for writing about music in Japan as a historian in the first place. There seems to be a general idea that music is an esoteric subject that is best left to specialists. I wrote a short blog (or was it a rant?) about this some time ago. For my second book project, I am hoping to edit and publish selected writings of Kate I. Hansen. Kate Ingeborg Hansen (1879-1968), a native of Logan, Kansas, spent most of her life as a missionary and music teacher in Sendai in Northern Japan. In the over 30 years she spent there from 1907 to 1941 and then again from 1947 to 1951 she not only did much for music education in the provincial town. Her letters and other writings reveal her to be an astute observer of musical culture in Sendai as well as a lively writer. I will certainly devote a chapter to her in my new book, Sounds of Modern Times, but her writings deserve a wider audience. This project, however, depends on my locating the copyright holders and receiving their permission, so fingers crossed! My other project, playfully entitled “The Meiji Miracle”, is still on the back burner. Years ago, as I worked on Private Academies in Meiji Japan, the lives of Meiji people, whether famous or less so, increasingly fascinated me. How did these people cope with the upheavals their country experienced in the late nineteenth and early twentieth centuries? How did they face the future in a present which seemed to be so different from the past that the past no longer appeared as a useful point of reference? – I started writing short biographies of selected Meiji Japanese from different areas of life with a view of turning them into a book. I had already published a series of short biographical articles covering the entire history of Japan for the German Japan-Magazin, published by the late Dieter Born. I actually completed a manuscript, but finding a publisher proved a challenge and at some point I lost momentum and turned my full attention to what eventually became Not by Love Alone. However, a few months ago I presented the prospectus to the members of a staff writing group and received some valuable suggestions. I was too busy with other projects to attempt the thorough revision of the manuscript in time for the 150th anniversary of the Meiji Restoration. Instead, I started mining the manuscripts for possible blog posts and have posted blogs about Ogawa Masataka 小川正孝, Tanaka Shôzô 田中正造, Sakamoto Ryôma 坂本龍馬, Tokugawa Keiki 徳川慶喜, and Yoshida Shoin 吉田松陰. The anniversary year has passed, but so much happened in the Meiji period (1868-1912) that for the next 44 years there’ll be some kind of ‘Meiji 150’ anniversary every year.